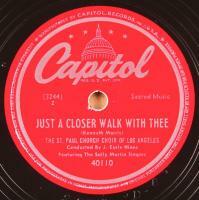 Fine Gospel sides by The St. Paul Church Choir Of Los Angeles featuring, J. Earle Hines and The Sally Martin Singers. Condition: V++; Plays fine but residue on grooves at beginnings of both sides resulting in light surface noise. Otherwise, generally clean copy aside from a very light scuff or two.